From the 9th to the 13th July a group of soldiers entered into three communities in Guerrero (Las Palancas, Puerto de las Ollas y El Jilguero) in the region of Coyuca de Catalán, in the area of Tierra Caliente. The soldiers fired gunshots into the air and at those who tried to flee into the mountains. The aim of the military excursion was to detain members of the Ejército Revolucionario del Pueblo Insurgente (ERPI), in particular the so-called commander Ramiro, whose real name is Omar Guerrero Solís, who organized a press conference from hiding on the 31st May. 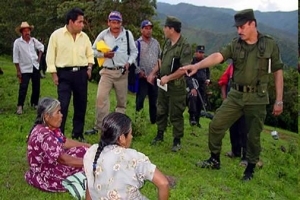 In his declaration, the commandor Ramiro accused a local political boss of using a paramilitary group with the aim of intimidating agricultural workers from the area who opposed deforestation or the cultivation of drugs in the area. Although on the 9th June, 60 soldiers entered into the communities, on the following day, even more arrived so as to provide reinforcements to those already there, bringing the grand total of soldiers up to around 500. During the five days, women and children of the area suffered harassment by the soldiers, and in some cases, torture. At last, the army withdrew on the 13th June, when a team of observers arrived, formed of Human Rights organizations, as well as various Civil Society organizations, such as the Human Rights Defense Commission of the state of Guerrero (Coddehum). The reports submitted by the Civil Society organizations talk of the specific torture of two individuals, as well as of house raids and the use of knifes that were placed on three women’s throats to make them give information regarding the whereabouts of their husbands. In addition, members of the communities suffered robberies, threats and various attempts by the soldiers to falsify tests that would suggest links between community members with armed groups and drug-traffickers, through the sowing of poppy seeds, as well as arms and other military equipment. This entry was posted on Tuesday, July 21st, 2009 at 5:41 pm and is filed under Guerrero, Human Rights, Indigenous people, Land and Territory, Militarization, torture, Urgent Action, Women. You can follow any responses to this entry through the RSS 2.0 feed. You can leave a response, or trackback from your own site.